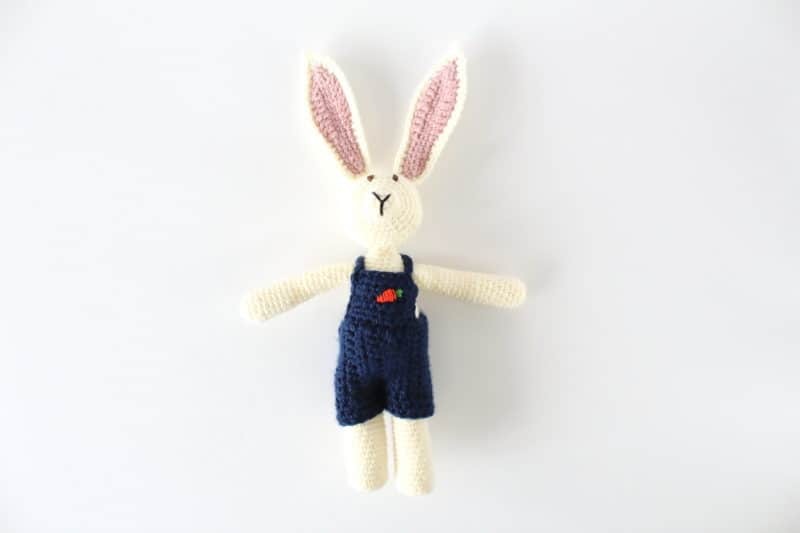 A few years ago, I made a crochet bunny pattern and it was one of my earliest designs. I really wanted to design a bunny that was a bit different than what was already out there, so I went with brown and blue for my colors. Looking back at him now, I realized how far I’ve come in amigurumi since then and it was time to make something new! 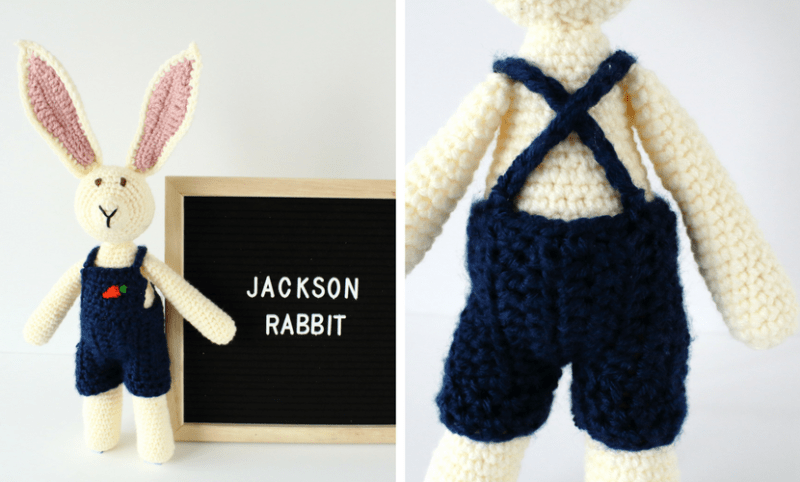 Now, I want to introduce Jackson Rabbit, my updated crochet bunny pattern! This guy is full of character and I hope you recreate him this Easter. 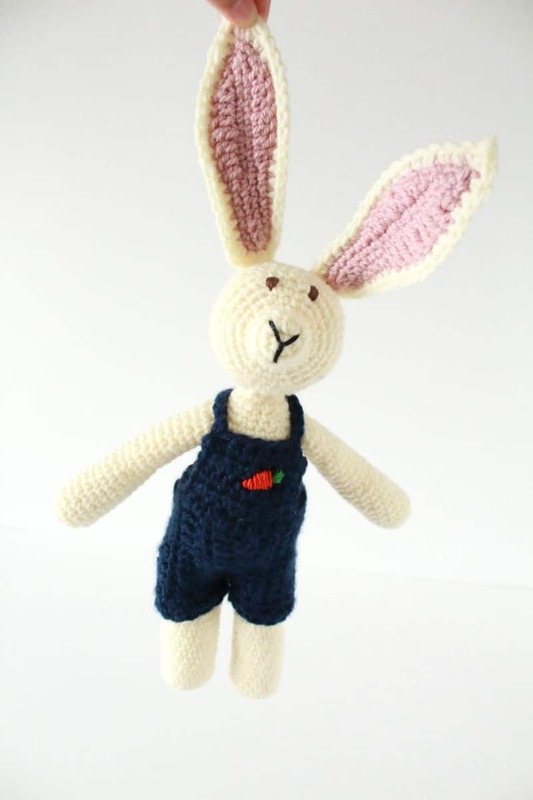 Here’s the free crochet bunny pattern below! 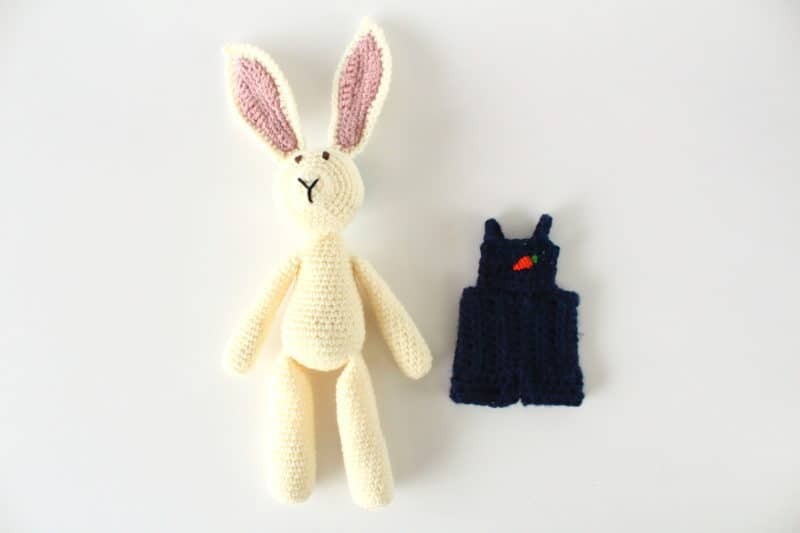 In my original crochet bunny pattern, I was still very new to amigurumi and designing in general. It worked for a while but now I can see how the old design was full of mistakes. This time around, Jackson is made with a much smaller hook and more evenly proportioned limbs. I also gave him a complete makeover and some awesome overalls. 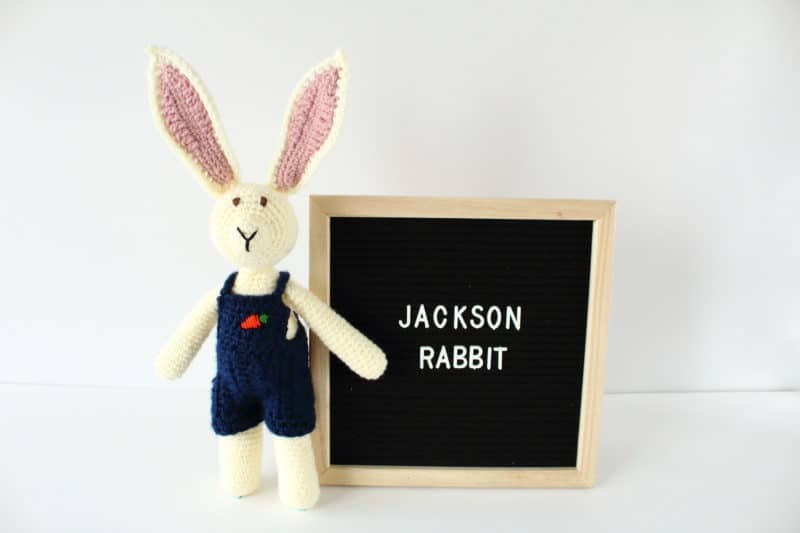 Jackson’s crochet bunny pattern is super easy to follow and recreate. All of this limbs are shaped with pretty basics techniques, then everything is attached at the end. The ears are stiff enough to stand up on their own, but you can always add pipe cleaners inside to make them a little sturdier like I did with wings of my Charizard. The overalls are also really simple since I broke them down into the basic shapes and then I just embroidered a little carrot on the front. The embroidery was the only tricky part, but that’s something I want to learn and get better at. Round 3-4: SC around for 2 rounds. Round 5: *SC 1, increase* and repeat this around (18). Round 6: *SC 2, increase* and repeat this around (24). Round 7: *SC 3, increase* and repeat this around (30). Round 8-12: SC around for 5 rounds. Next, add the stuffing to the head. Round 13: *SC 3, decrease* and repeat this around (24). Round 14: *SC 2, decrease* and repeat this around (18). Round 15: *SC 1, decrease* and repeat this around (12). Then finish adding the stuffing now. Round 16: Decrease around until you have 6 stitches and trim the yarn with a couple inches to spare. Thread the end of the yarn through a tapestry needle and bring the needle under the front loops of the last 6 stitches. Then, pull to close the opening and secure your yarn with a knit. Trim the yarn and then weave in the excess. Round 1: With the 3.00mm crochet hook and cream yarn, create a magic loop. Work 6 SC into the loop and pull the loop closed (6). Place a stitch marker to mark the first space. Round 3: *SC 1, increase* and repeat this around (18). Round 7-9: SC around for 3 rounds. Round 10: *SC 4, decrease* and repeat this around (30). Round 11-15: SC around for 5 rounds. Begin to add the stuffing to the body now. Round 16: *SC 3, decrease* and repeat this around (24). Round 17-21: SC around for 5 rounds. Round 22: *SC 2, decrease* and repeat this around (18). Finish stuffing the body. Don’t overstuff so the stuffing shows through. You want it to be slightly firm, but still soft enough to squeeze. Round 23: *SC 1, decrease* and repeat this around (8). Bind off and leave a long tail for sewing the head on later! Round 4-18: SC around for 15 rounds. After a few rounds, add a small amount of stuffing the only the “feet”. If you like, you can also lightly stuff the rest of the leg to give it some padding, but I didn’t. Round 20-22: SC around for 4 rounds and bind off, leaving a long tail to sew the legs on later. Note: In the picture below, I sewed the legs together but I undid that later. Round 3-22: SC around for 20 rounds. After a few rounds, add a small amount of stuffing the only the “hands”. If you like, you can also lightly stuff the rest of the arm to give it some padding, but I didn’t. I like the shoulders to lay flat. Bind off and leaving a long tail for sewing the arms on later. Round 1: Using cream yarn and a 3.00mm hook, chain 17. Starting from the 2nd space from the hook, SC 15, work 2 SC into the next space, turn to work into the other side of the chain and SC 16. You have 33 stitches now. Slip stitch to the first space. Round 2: SC 6, HDC, DC 3, Tr, DC 3, HDC, SC 2. Chain 3, and slip stitch to the first chain space to create the point of the ear. Then SC 2 starting with the same space you last worked, HDC, DC 3, Tr, DC 3, HDC, and SC the last 6 (34 stitches). Bind off. 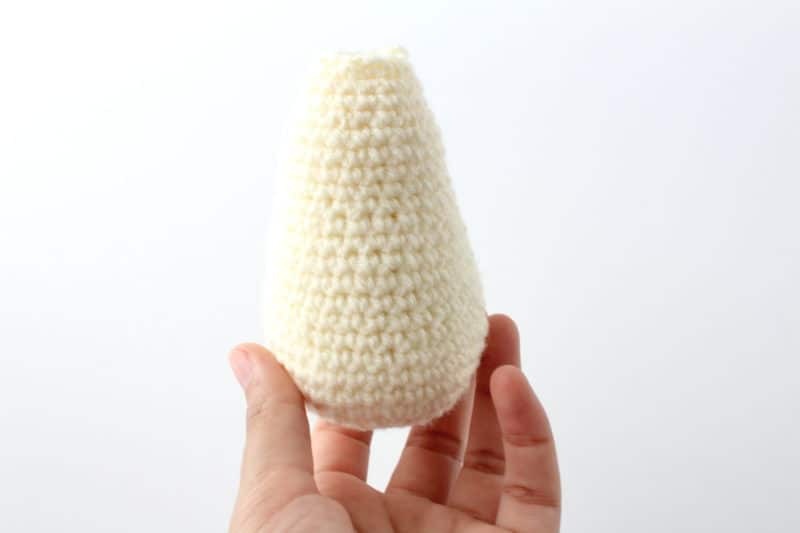 To make the ears of this crochet bunny pattern, we need to attach the two layers for the inside and outside of the ears. Create two ears in cream and two in pink. Then, stack a pink ear on top of a cream one, and attach a new piece of cream yarn to the start of the round. Hold the two pieces together and work 18 HDC through both the pink and cream stitches to join them. At the top of the ear, chain 3, slip stitch to the first stitch, and HDC into the same space. HDC through bother pieces to the end of the round and bind off. Be sure to leave a long tail to sew the ear onto the head. 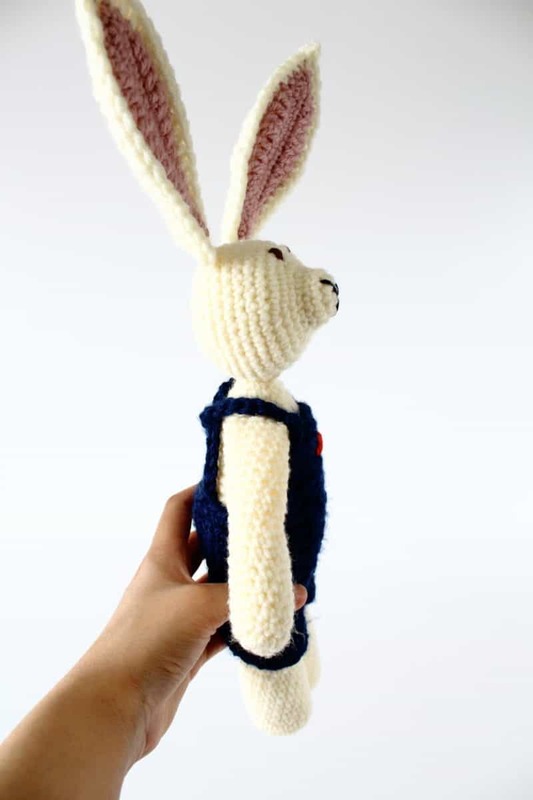 We’re almost done with the crochet bunny pattern! 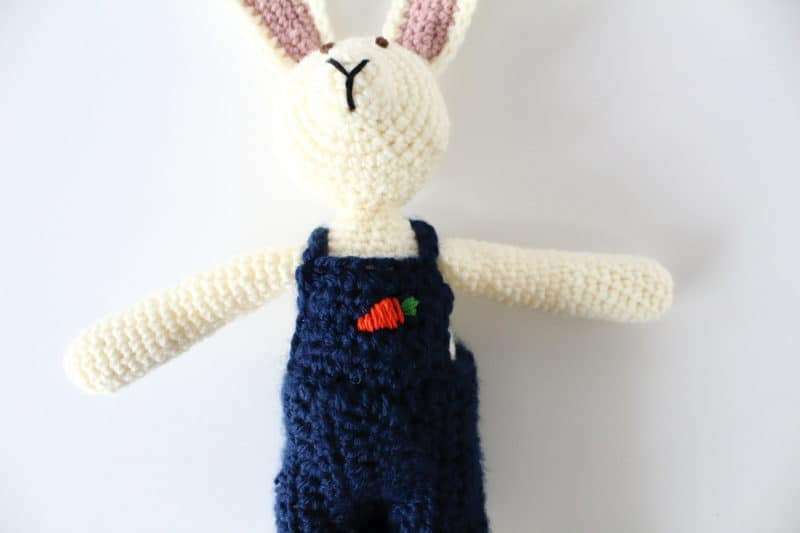 All we need to do now is assemble all of the pieces we made to have our finished bunny and then make the overalls. First, let’s attach the ears to the head. Mark the place 6 rounds from where you bound off the head, the round before you started decreasing. 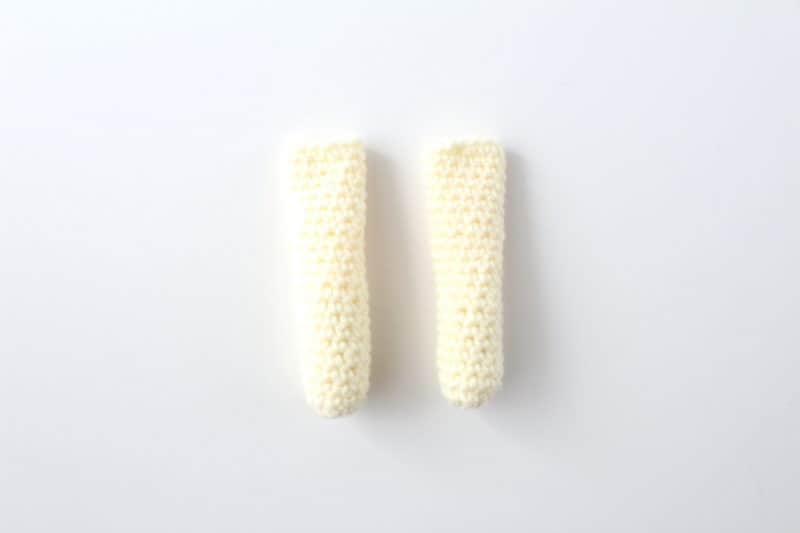 Position the ears on this row and hold it in place with a pin or stitch markers. Then thread the tail end of the cream yarn through a tapestry needle and sew the ears into place. You just go into one space on the ear and then into a space on the head until the ears are secure. Then fasten off the yarn, then weave in the ends and trim the excess. Next, attach the legs to the fifth round from the bottom of the body. 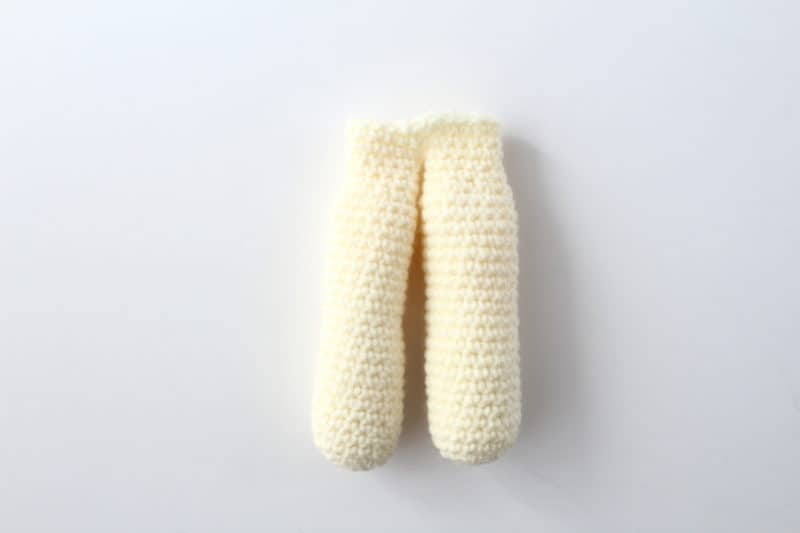 Hold the top of the leg closed so it’s flat and attach it the same way as the ears, and be sure to go through both stitches on the leg and one space on the body. Fasten off the yarn, then weave in the ends and trim the excess. Then, attach the arms the same way to the fifth round from the top of the body. Finally, use the tail end of the body and thread it through a tapestry needle. Position the head onto the body and pin it in place. Sew the head onto the body by going around and stitching one space of the neck to a nearby space on the head. Work all the way around and fasten off. Finally, weave in the loose ends and trim the excess yarn. Row 1: With the navy yarn and a 4.50mm crochet hook, chain 12. Turn and DC 10 starting from the 3rd space from the hook (10). Rows 2-22: Chain 2, DC into each space. Continue until the piece is long enough to go around the widest part of the body. If you need to, add a row or two. Then bind off and use the tail end to sew the ends closed to form a tube. Row 23: Hold the tube flat and attach a new piece of yarn to the center, where the legs would part and SC 13 stitches along half of the tube. Join at the center to work in rounds. Rounds 24-26: SC around for 3 rounds and bind off. Then repeat rows 23 to 27 to make the other pant leg. Row 1: With the overalls flat, attach a new piece yarn 2 stitches from the end and SC 9 across the front. Rows 2-4: Chain 1, turn and SC to the end of the row. Bind off. 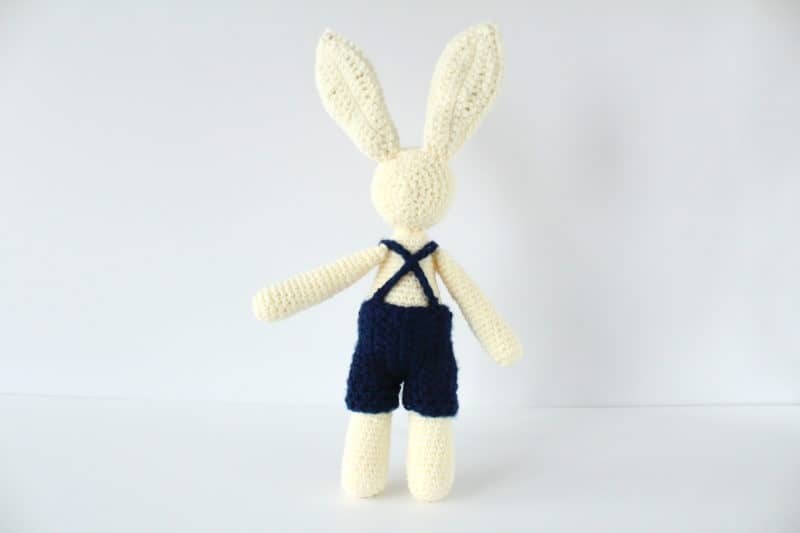 To make the straps for the overalls on this crochet bunny pattern, dress the bunny in the overalls so far. 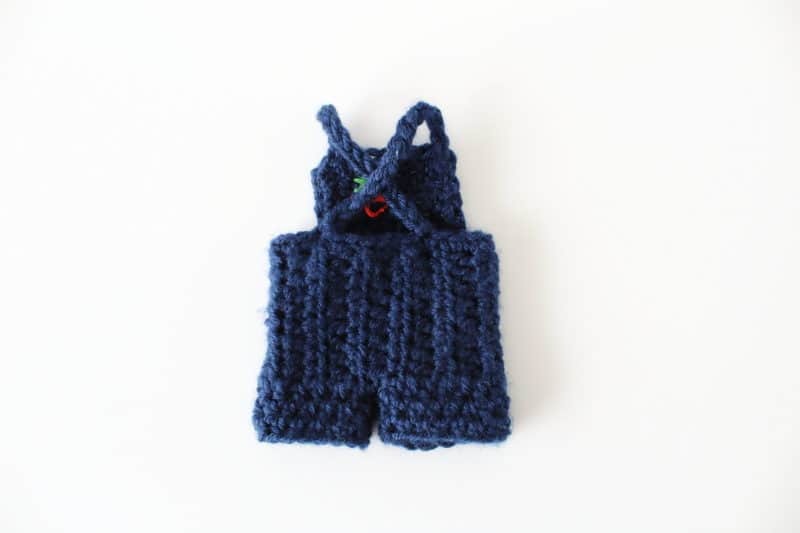 Then use a 3.00mm crochet hook and attach a new piece of navy yarn to the corner of the front of the overalls. Chain 13 (or longer if you need to) to create one strap that goes over the shoulder and meets the back of the overalls on the opposite side. Bind off and then sew the end of the chain in place. Finally, create the second strap the same way and attach it to the other side. 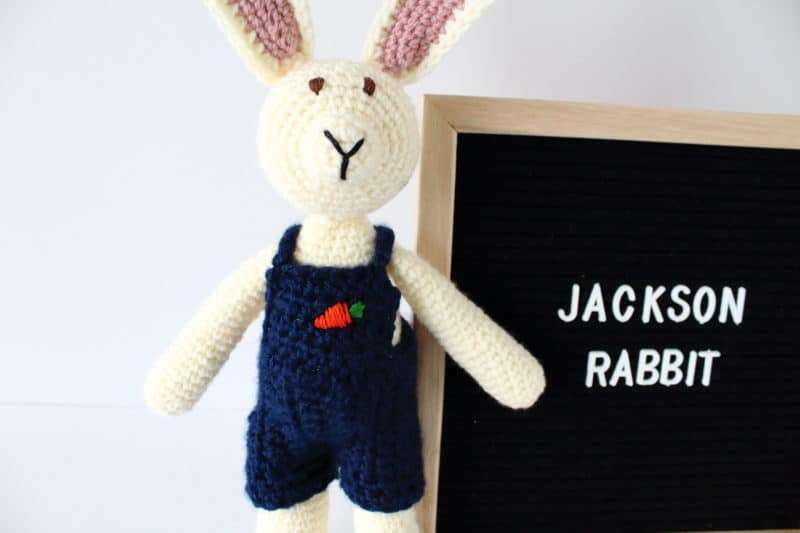 To add the face to our crochet bunny pattern, use embroidery floss and a few small stitches to embroider on a nose/mouth in a Y shape to the pointed end of the head. Then use a brown floss and small, vertical stitches to embroider on eyes 2 rows above that. 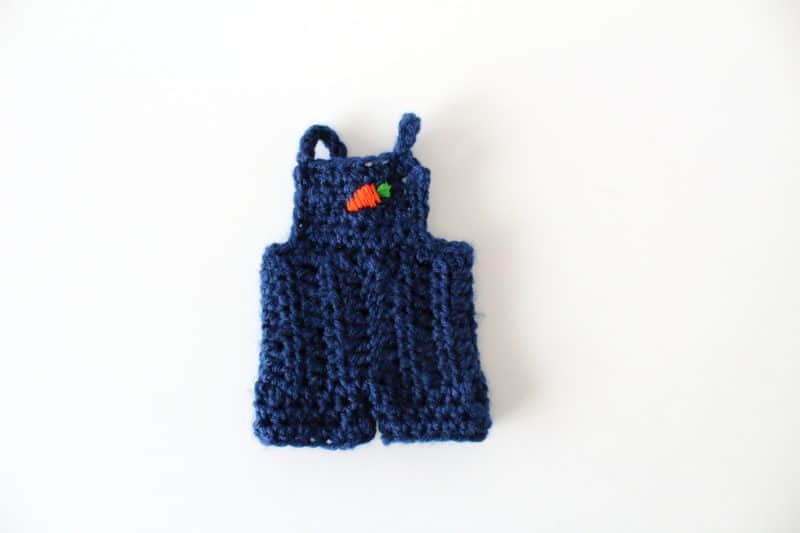 Finally, if you ‘d like to, embroider a little carrot onto the front of his overalls. I just freehanded a long triangle and added a few green “leaves”. 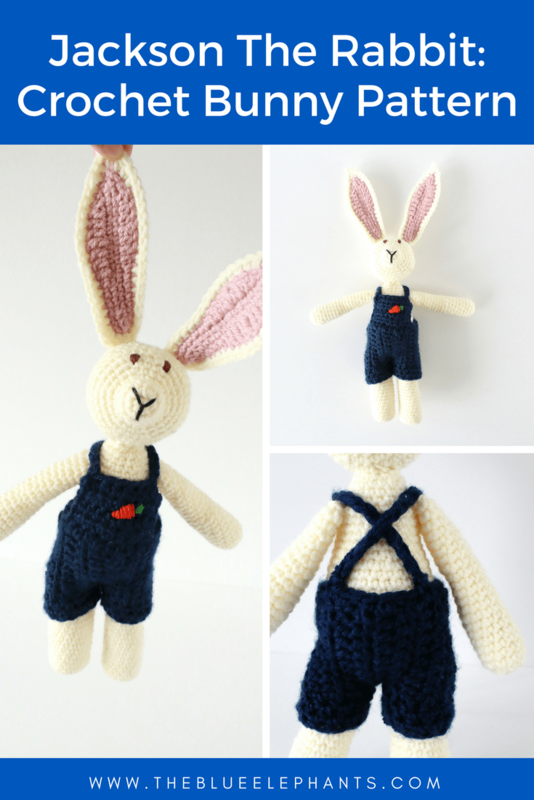 This crochet bunny pattern does have a lot of parts, but it works up quicker than you’d think. The ears and the overalls make it sound more complicated than it is. 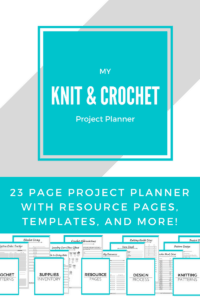 I actually didn’t realize there was this much involved until I had to write the whole pattern out! I really encourage you to give this a try and let me know how it goes! I imagine my Jackson Rabbit to be like an Elf on the Shelf, but for Easter. He’s the friendly rabbit that comes to see how you are and find good places for the Easter Bunny to hides the eggs. 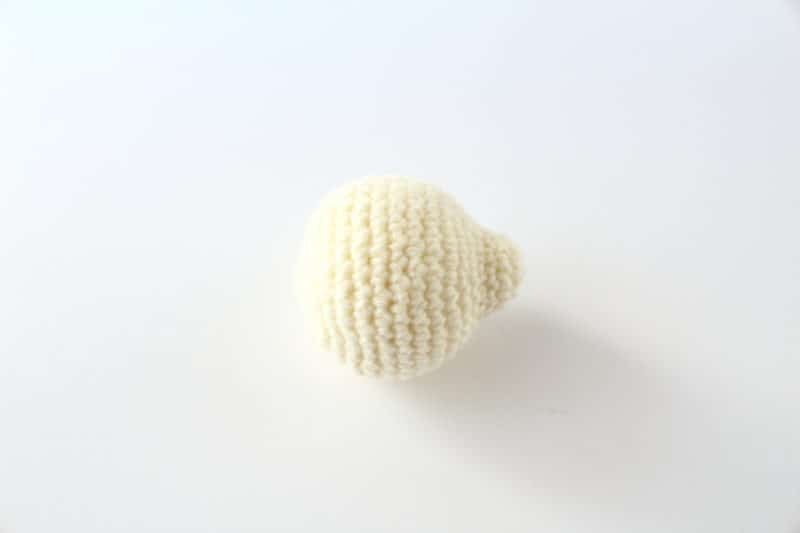 Another great Easter pattern is my crochet sheep, Sammy! He’s a lot simpler than Jackson and works up quickly with big blanket yarn and an 8.00mm hook. 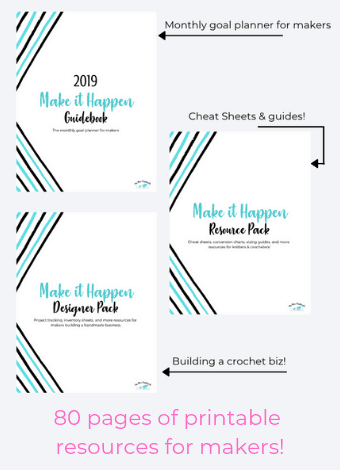 Take a look and get the free pattern below! Thanks so much for reading! If you liked this, check out some of my other plushie patterns. And if you want to get new free patterns delivered right to your inbox every month, use the box below to sign up for the newsletter! Jackson looks very dapper in his overalls. What a lovely little pattern. thanks. Thank you, Julie! The overalls took a few tries before I figured out how to make them fit, but it was so worth it!